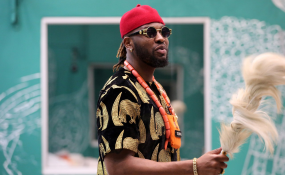 Reports have it that the duo, known collectively as BamTeddy, are the only couple with 'an intact' relationship post BBNaija double wahala which has left fans wondering how they sustained it. On Wednesday night during the BBnaija #DoubleWahalareload and reunion show, BamBam told fellow ex-housemates and host, Ebuka Obi-Uchendu that they genuinely love each other and this has kept them stronger. BamTeddy went down memory lane, digging out details from the budding moments of their relationship, revealing how judging each other's personalities almost ruined it. BamBam said, "I was just scared of the unknown. I judged him. Like I always said, I judged the book by the cover. "Vandora and Alex came to calm me down because they saw how terrified I was and told meh was a good person. "I think they did the same with him. Somehow, he wanted up to me although he was not very nice to me in the beginning. "When he let his guard down a bit and drew me in, I realised he was a nice guy. I didn't think we were ever going to have chemistry the way we do. I couldn't resist his charms and here I am," she said. When Ebuka asked Teddy A how they have kept the relationship running despite being opposites, he pegged it on understanding. He said, "Honestly, I don't know but I feel it's more about how we feel about each other like she said. "We weren't each others types and I didn't like the fact that she carried the whole 'I am a church girl' attitude. "As we spent time together, she saw what was in the inside We have come to understand each other's differences and respect them," he said. Reports have it that the couple were the second most controversial in the house, after Tobi and Cee-C. However, they shared a visible bond that endeared fans to them. Teddy A, who usually maintained a solid facade, cried bitterly when BamBam was evicted and was relieved when he was evicted the next day. The duo maintained their relationship after the show and even have joint businesses and media appearances, presenting a solid front. Fellow ex-housemates applauded their resilience with Anto wittingly commenting that she could not wait for the wedding Aso-ebi.